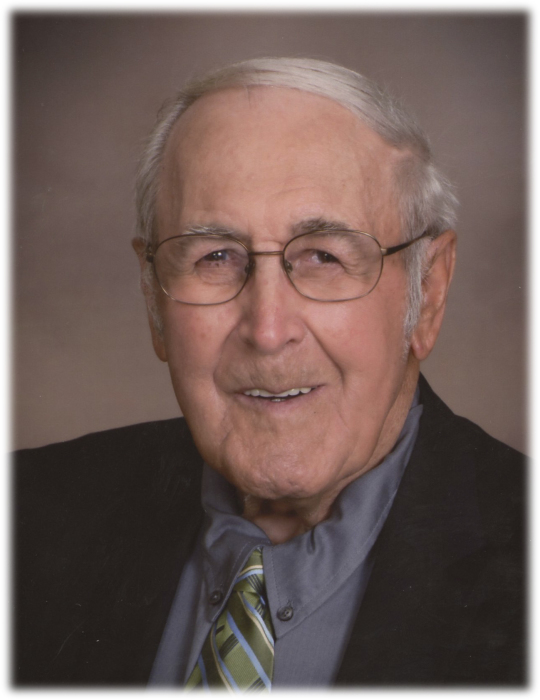 John C. Fiers, Jr., 87, of Geneseo, went home to meet Jesus on Saturday, January 26, 2019, at his home. A Funeral Mass will be held on Saturday, February 2, 2019, at 10:30 a.m., at St. Malachy Catholic Church, Geneseo. Father Michael Pakula will officiate. Burial will follow at North Cemetery in Geneseo. Visitation will be held on Friday, February 1, 4-7 p.m. at Vandemore Funeral Home and Crematory, Geneseo, IL. There will be a scripture service at 7 p.m. Memorials may be directed to St. Jude Children’s Hospital and Alzheimer’s Research. John was born on May 20, 1931, the son of John Fiers, Sr. and Alice (Marten) Fiers, in Geneseo, Illinois. He is a graduate of Geneseo High School. In high school, he raised show cattle, won champion Hereford one year and reserve champion for Black Angus the next. Out of high school, he took a job at John Deere Harvester Works and enlisted in the Army Reserves. John married Nancy Munson on September 12, 1953, at St. Malachy Catholic Church, Geneseo. John was a lifetime farmer in rural Geneseo and a Pioneer Seed Corn dealer for 25 years. He was an innovative farmer and was one of the first to have an irrigation system and to use nitrogen in the area. He had a very strong work ethic that defined his life. He was passionate about helping with prison ministries, including the Henry County Jail, East Moline Correctional Center and Galesburg Correctional Center. John was instrumental in organizing the first WATCH group at St. Malachy parish. He became president of the WATCH board. The WATCH ministry grew to churches in Illinois, Iowa, Tennessee, and Colorado. He was president of the Men’s Full Gospel Fellowship in Davenport for many years. John was an avid NASCAR fan and especially liked to watch the driver, Jeff Gordon. He even spent time as a stock car driver at the Moline Speedway. John loved his Hayden’s Hikers buddies, the Cubs, and the Bears. He enjoyed fishing on summer vacations to Minnesota with his family. He especially loved and looked forward to his annual trip with his wife to Waikiki Beach, Hawaii for 25 years until it became difficult for him to travel. He shared his love for Jesus with whomever he could and wherever he traveled. Those left to cherish his memory include his wife, Nancy; son, Steve (Julie) Fiers, Geneseo; daughters, Susan Fiers, Schaumburg, IL, Sherry Leftwich, Hampton, IL and Becky Jo (Troy) Clark, Davenport, IA. His grandchildren are Justin Fiers, Ashley Leftwich, Amanda Fiers, Zachary Leftwich, Hunter Fiers, Broch Leftwich, and Jessica Bailey. His great-grandchildren are Aidan, Ava, Chase, Violet, Maggie, Carstin, William and Liam. John was preceded in death by his parents, and sisters, Marjorie Fiers, Pat Wahlheim, and Mary Ann Buechler.